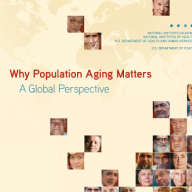 On March 15, 2007, the U.S. State Department, in collaboration with the National Institute on Aging (NIA), hosted a summit on global aging, resulting in a report that identifies nine trends in global aging that represent a snapshot of challenges and opportunities that should stimulate a cross-national scientific and policy dialogue. The report relies on data from the United Nations, U.S. Census Bureau, and the Statistical Office of the European Communities, as well as regional surveys. The report won the silver National Mature Media Award in 2008. RLA transformed an initial draft of Why Population Aging Matters: A Global Perspective into language accessible to its target audience—ambassadors and their staff, educated lay persons, and the public—with strict attention to the scientific integrity of the work, including extensive fact checking, additional research to locate appropriate data, and conscientious efforts to ensure consistency with primary documents. RLA managed the clearance and production process to realize publication in less than 2 months.